Nobody ever mistook Pink Floyd for modest, but their fourth album is rock excess of the worst kind. 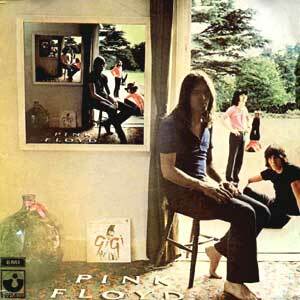 Ummagumma is a double, of course, with the first disc comprised of live cuts recorded in Birmingham and Manchester and the second devoted to one composition from each member. The live material represents a typical setlist from the late ‘60s and therefore bears some historical curiosity. They draw out “Set the Controls for the Heart of the Sun” nicely, toying with that understated tension as they race toward their destination, but of these four tracks, only “Careful With That Axe, Eugene” sounds truly definitive, although that has the benefit of being a previously unrecorded live staple. The studio material on the second disc corrals some convoluted suites by drummer—excuse me, percussionist Nick Mason and keyboard player Richard Wright, who aren’t frontmen for a very good reason. Their multi-section compositions meander noisily and pointlessly, with none of the kinetic din of their previous material. Only Roger Waters’ “Grantchester Meadows” strives toward any sort of traditional song structure, yet it segues smoothly into five minutes of animal sounds. Ummagumma is Pink Floyd at their most bloated, although at this point in their careers it’s a very different kind of bloated than The Wall (thematically overstuffed) or A Momentary Lapse of Reason (sonically swollen). Looking for transcendence in synthobirds and what sounds like monkeys cavorting in a Steinway showroom, they mistake aimlessness for import, in the process creating a towering monument to rock self-indulgence.